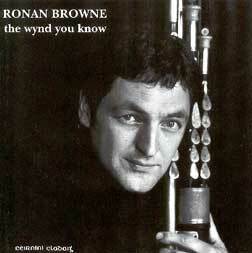 Although Ronan Browne's piping is well known among other players of the instrument and to those who are familiar with his previous CD "The South West Wind" and his work with the band Cran, it may be safe to say that he hasn't acquired the stature of a Paddy Keenan or a Liam O'Flynn. Let's hope that this new recording helps him get a well deserved wider recognition. Browne's piping is extremely skillful and inventive, his sometimes unconventional regulator work being especially notable. This new recording will be especially appreciated by lovers of airs, of which there are no less than seven out of the fourteen tracks. Included are classics like "Were You at Carrick?," as well as the beautiful Donegal tune "Paddy's Rambles through the Park," played as a duet with Kevin Glackin (fiddle), with a harmonium accompaniment by Triona Ni Dhomhnaill. Other duets with Glackin include a set of characteristic Donegal tunes, an highland and two reels, and a set of jig on which Browne plays flute, both tracks featuring impressively tight playing. 8. Air: An Raibh Tú ag an gCarraig?